Content Groups are a new feature in Google Analytics that allow the analyst to, as their name suggests, group areas of content together so that they may be more easily identified and analysed. When Google Analytics launched in 2005 it democratised web analytics with its feature rich offering, that said one aspect which was missing was the option to group content at the visit level. Other tools at the time such as HBX dealt with this very well but Google, with its URL based content reports and lack of segmentation couldn’t deal with it without some rather involved configuration at the account level. The important point to keep in mind here is that content couldn’t be grouped at the visit level of reporting, it was possible to do so at the page view level by using a report filter but this is almost useless since the primary reporting metric is visits. advanced segments afford a greater degree of analytical control and flexibility but for non premium users they are subject to the vagaries of GA’s sampling. goals are more accurate in context of data output but they are limited to a single metric – visits. Enter Content grouping which, though very good, also has it’s limitations. Content grouping was introduced in December 2013. It’s configurable at the ‘View’ level of the Admin section and permits the user to apply up to five content groups, this is it’s main flaw. It would be greatly improved in terms of its utility if it provided more. Which content should you group? This depends on the kind of site you have. If you’re running an e-commerce site then you might prefer to group content by page type e.g. list page, product details page etc., this will help you better understand the level of engagement with each of the key steps in the on-site customer journey. If you run a publishing site or similar you may prefer to group content by subject matter since page type may be less relevant e.g. news, weather, etc. The main issue I see here is that there will doubtless be not enough content groups to cover off all the areas you would want to group so you would have to be judicious in your selection of the most important content. It is possible to configure content using one or more of these options and you will need to consider each according to your site. You may prefer to use the tracking code option if you have a set of content that has a URL structure which doesn’t change or is the same as the URL structure in other parts of the site. You may prefer to use the extraction method if you simply want to group content according to a folder within a URL. Here, you may need to have a basic understanding of how Google Analytics uses regular expressions in order to maximise this. You may prefer to use a set of rules definitions if you need to apply a slightly more complex filtering process e.g. instances where you may wish to include content that includes one element of a URL but not another. The benefit of the second and third options is that they don’t require any changes to be made to the GA tracking code and so no dependence of developer time. and from here you will then be presented with the three configuration options shown above. When setting up Content Groups you should remember that like goals, data is only collected from that point onwards, in other words it isn’t collected retrospectively. You should also remember that while you can switch Content Groups on and off you cannot delete them. you can however edit them but if you do this in such a way that they start tracking different content or the same content with a different URL element (perhaps after a site rebuild or redesign) then you should make a note in Google Annotations on the day that you made the configuration change to help remind yourself why the data output might have changed. Once you have set up your content groups and data begins to be aggregated within them there are a couple of ways which you can view the data. Go to the All pages report in the ‘Behaviour’ reporting menu. Behaviour > Site Content > All Pages. Here you will see the normal report but you will also notice that Content Grouping is now presented as a new Primary Dimension offering. by clicking on the dropdown you can then select the content group you’d like to view. An alternative and more powerful option would be to create a custom report using the content groups. 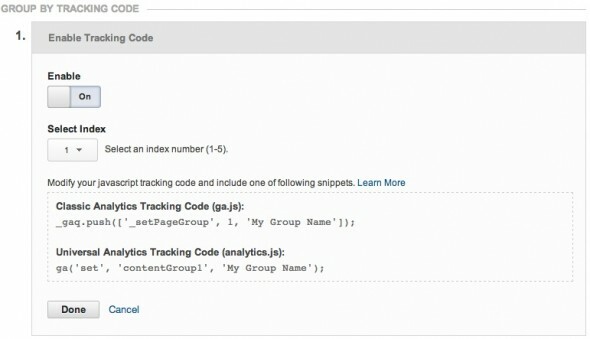 Content Groups + custom reports = better insight. 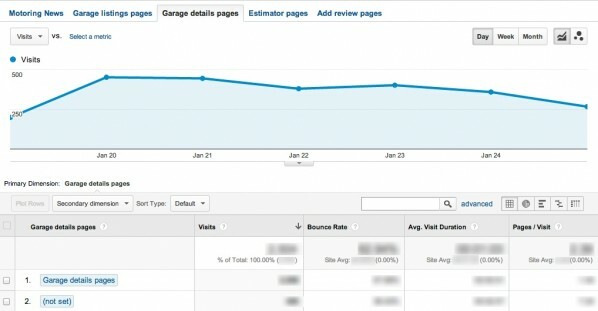 The main problem with the standard Content Grouping reports in that the primary reporting metric is pageviews or unique pageviews, this is at odds with the primary reporting metric for most sites which is usually visits. Because of that it’s not really possible to calculate conversion to a specific content group using these two different metrics. The solution is to create a custom report. If you have used up all five content groups then you will be best off creating one tab for each content group in your custom report. See the example below. You can then apply the metrics for each group, beware that there are some limitations in terms of which metrics you can use and you will not necessarily know which metrics this applies to until you’ve viewed the report and seen whether or not data has populated, but as an initial indicator some revenue metrics will not work. Page value should be fine if you have an e-commerce site. You can then use the various charting functions to interpret the data and draw your own insights from it. Identify which types of content you want to group. 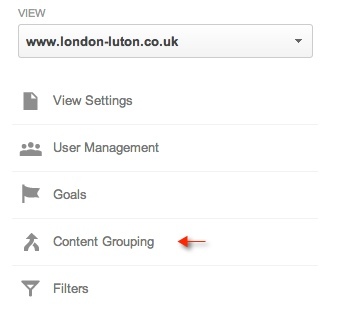 Configure your content grouping in the admin area under the ‘View’ section. Wait a few days or weeks to gather enough data. Create a custom report to help in analysing your new data. Good insight. Just wondering. What if a product page features in 2 or more groups within the same grouping? Or am i correct in thinking a product page can only feature in 1 group in a grouping. Do you know how to get round it if a website is set up with products featured in more than one group. If you are asking what to do with a page or group of pages that can reasonably be applied to more than one content group, then I would say this is really a decision for the analyst. There is nothing to stop you from adding pages or groups of pages to more than one content group, but if you do then you just need to be aware of that fact when you are running your analysis. The result will be that you will have some cross over in terms of data counts between the two groups but that is fine as long as you are aware of it. I hope that answers your question but do follow up if you’d like some more clarification.